The savanna areas of southern Africa are interspersed with bare granite outcrops that sometimes rise to heights of hundreds of feet. Weathered- rock slides accumulate around their edges and these as well as the crevices of the rock face are the home of the flat lizards. They remind one of the Chuckwallas among the iguanids in their ability to lock themselves into crevices by inflating the body. Unlike the Armored Zonures, the male flat lizards are often brightly colored with carmine set off with black, green, and blue areas. 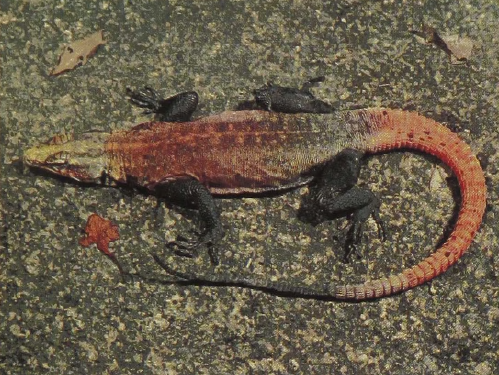 These foot-long, egg-laying flat lizards feed primarily on grasshoppers and beetles, which they hunt during the day. Their social behavior is only now being studied.